Oh, okay. 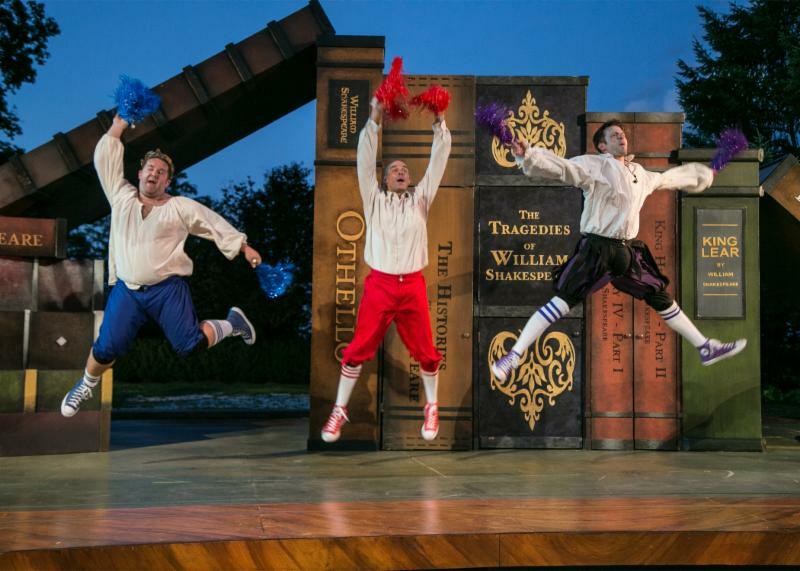 Onstage are three of the troupe's most versatile and accomplished actors (directed by another who is world-class clown) performing Adam Long, Daniel Singer and Jess Winfield's irreverent spoof, The Complete Works of William Shakespeare (abridge) (revised), on the outdoor stage where it runs through July 31. 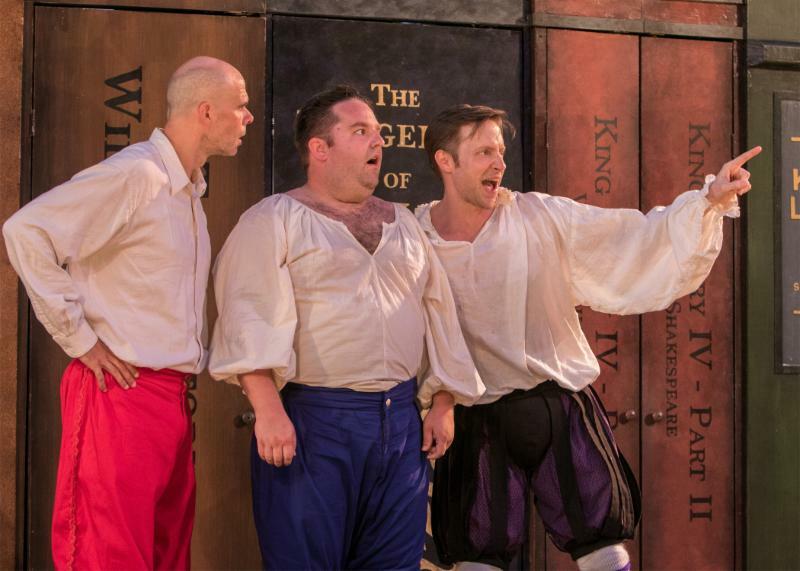 Actors Jon Barker, Connor Carew and Patrick Toon attempt to convince us they know everything there is to know about Shakespeare, but they manage to mangle, mix up and manipulate the plays to a fare-thee-well. They switch roles with alacrity—often confused about who is playing whom—and even coerce the audience to participate in the pandemonium. Think Monty Python meets the Marx Brothers. “The Scottish Play” (a k a Macbeth) out‑Scottishes the most ardent kilt‑wearer, and the gory Titus Andronicus becomes a cooking show. Hamlet is presented four times—once backwards! Othello is performed as an Hamilton rap number. Because Shakespeare is a formula writer, the comedies are combined into one, entitled “Cymbeline Taming Pericles, the Merchant, in the Tempest of Love As Much as You Like It for Nothing” or “The Love Boat Goes to Verona.” The history plays are performed as a football game, with a crown as the pigskin! 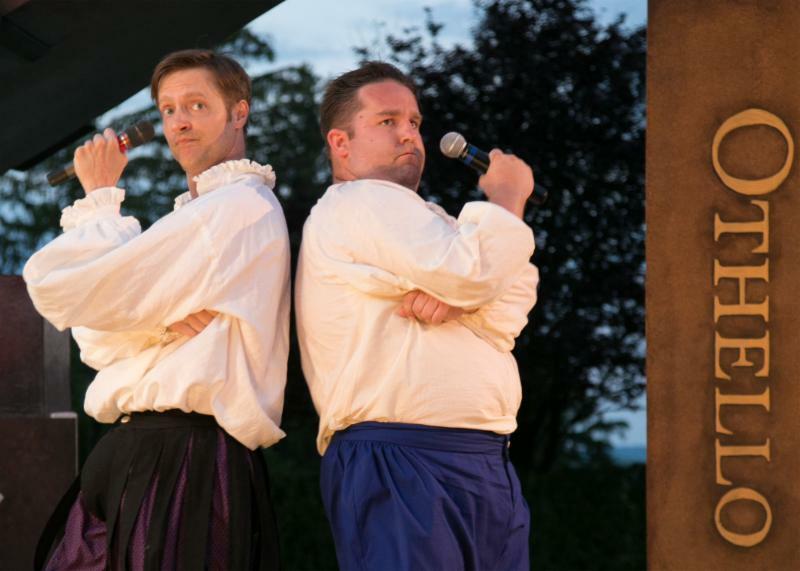 Complete Works of William Shakespeare (Abridged) (Revised) will be performed at the Greek Amphitheatre on the campus of St. Elizabeth College in Convent Station through July 31. Evening performances begin at 8:15. 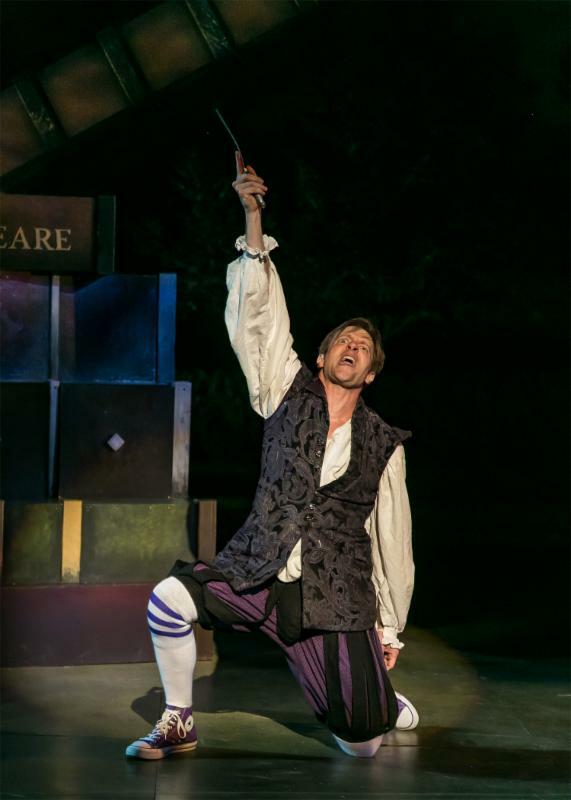 For information and tickets, call the box office at 973.408.5600 or visit www.ShakespeareNJ.org online. HOT SUMMER EVENTS @ TWO RIVER THEATER IN RED BANK! You never can tell where the danger lies. TICKETS: $18.00 ($12.00 Student/Child/Senior), and are now available online at www.blackboxnynj.com or by calling 201-357-2221. 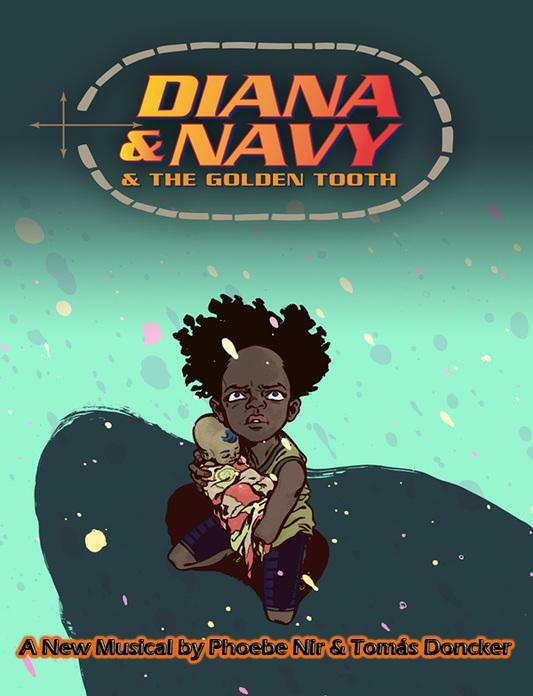 Diana & Navy & The Golden Tooth is the first installment of the epic saga of the Webber sisters, two extraordinary African American girls struggling to survive in a post-apocalyptic Southern bayou. Following his collaboration with Pulitzer Prize-winning poet Yusef Komunykaa ("perfect... heavy duty, industrial blues" —Huffington Post), composer Tomas Doncker has teamed up with Presidential scholar of the Arts Phoebe Nir to create a new musical about the throbbing heart of America. This first workshop production, directed by Matt Okin, is presented at Teaneck's Black Box Performing Arts Center. With Laura Alba, Ellen Camacho-Walsh, Acadia Colan, Dana Ferguson, Brianna Fernandez, Eitan Hiller, Mike Kinzer, Vikki Martin, Aaron McMillan, Nate Murphy, Zaia Rolfe, Brandon Shapiro and Aurelia Williams*. Featuring The True Groove All-Stars Band. *Appearing courtesy of Actors' Equity Association. AEA approved Showcase. The production features set design by Frank Avellino and lighting design by Gerard Bourcier. Haia Bchiri is the production stage manager and Naima Hirsch is the assistant to the director and stage manager. Produced by Tomas Doncker, Marla Mase, Huey Esquire and Matt Okin. I Am Not Throwing Away My SPOT! Register today for upcoming Rising Star Academy July Sessions before all spots are full! Choose from one of our THREE Options for July! OPTION ONE: "Rising Stars Youth Production - High School Musical Jr."
Campers’ final showcases will focus on the study and performance specific to recently Tony-nominated Broadway Revivals such as South Pacific, The King and I, Annie, The Music Man, Pippin, Shuffle Along, Forty Second Street, She Loves Me, Fiddler on the Roof, and others. Immerse yourself in a full day of musical theatre fun! The Full Day, "Broadway or Bust" option combines you child's desire to both train and perform. Get a solid foundation in your triple-threat training each morning from 9:00am-12:30pm, and rehearse for the musical production of High School Musical, Jr every afternoon from 1:00-4:30pm! CLICK HERE or the "Option" links above to fill out a registration form or request us to contact you. P.S. Planning to audition for Gypsy? Don't forget to "Let Us Entertain You" at our Gypsy Audition Workshops June 25 and 26th! ADMISSION: $12.00 JCC member; $15.00 non-members. Sponsored in part by Brad-Core, Humanism in Building. Well, now you can. Asbury Shorts, a touring exhibition that presents these highly entertaining films in high prestige venues around the country, will bring its nationally-acclaimed, short film exhibition to the JCC. The night will include a full evening of award-winning films, curated from the top global film festivals and will feature a mix of Oscar winners and nominees in short film comedy, drama, animation and documentary. This program offers a rare opportunity for people to see great films on a large screen in a real theater setting. A sample of films that will be screened include: Fait d’hiver; directed by Dirk Belien; The Timmy Brother’s Water, directed by Paul Riccio; and Hypothetically, directed by Peter Zinn. To register call Kathy at 201 408.1454 or visit www.jccotp.org. PETER AND THE STARCATCHER is the most hilarious-filled evening of madcap fun! In this 5-time Tony Award-winning play, a dozen brilliant actors play more than 100 unforgettable characters using their enormous talent, ingenious stagecraft and the limitless possibilities of imagination. This swashbuckling grownup prequel to Peter Pan will have you hooked from the moment you let your imagination take flight. ENJOY JULY 4TH AS THE FOUNDING FATHERS WOULD HAVE WANTED IT! For the fourth year in a row, visitors to, and residents of Morris County will have the opportunity to enjoy an authentically, patriotic 4th of July the way the Founding Fathers might have imagined it. This year, in addition to celebrating the country’s independence, the event will also salute the 100th anniversary of the National Park Service and the 200th anniversary of the Trustees of the Morristown Green. The schedule of events spans a period during which Morristown National Historical Park will be free and open to the public in honor of their Centennial and the July 4th holiday. On Saturday, July 2nd, the Hanover Township Landmark Commission kicks off the weekend with a free tour of its 1718 Burying Yard located off of Route 10 East in Whippany. This one-hour tour will highlight people who first settled Morris County and are buried in the cemetery. Morristown National Historical Park will be free and open to the public from 9:30 a.m. to 5:00 p.m. Visitors will be able to view a special National Park centennial exhibit, as well as the museum and Ford Mansion at the Morristown unit of the park. On Sunday, July 3rd, Morristown National Historical Park will host a Revolutionary War encampment at the Ford Mansion. Costumed reenactors will be on hand demonstrating a soldier’s life in the Continental Army. The park will be free and open from 9:30 a.m. to 5:00 p.m. Between 1:00 p.m. and 3:00 p.m. the park welcomes the United States Army Old Guard Fife and Drum Corps for a lawn concert. Bring blankets and chairs. Rain location will be on-site in the Washington’s Headquarters Museum auditorium. The Morris County Park Commission, the Morris County Tourism Bureau and The Town of Morristown are pleased to present a fireworks display, also free to the public, on Sunday, July 3rd. Fireworks will begin at 9:15 p.m. at Central Park of Morris County, off West Hanover Avenue in Morris Plains-Parsippany. Parking is limited and early arrival and carpooling is recommended. Central Park of Morris County will be open for picnicking beginning at 7:30 p.m.
Monday, July 4th, events will begin at the Ford Mansion where the Continental Army reenactors will march to the Morristown Green at 11 a.m. The public is invited to fall in and march with them. At the Morristown Green there will be family activities beginning at noon. Eric Olsen and Tom Winslow of Morristown National Historical Park’s ranger corps will provide the colorful, annual Reading of the Declaration of Independence, a long-standing Morris County tradition, at 12:30 p.m. Following the reading there will be a musket salute and free guided tours of the Presbyterian Church of Morristown’s church and Colonial-era graveyard. This is a rain or shine event. 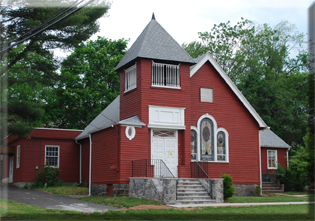 In case of rain the event will be held indoors at the Presbyterian Church, 57 East Park Place, Morristown. For more information, contact the Morris County Tourism Bureau at www.morristourism.org or call 973-631-5151. Bret Michaels: The Party Starts Now! To purchase tickets for the “Westfield Garden State Plaza Concert Series,” visit www.Ticketmaster.com, the bergenPAC Box Office or call 201.227.1030. Also included as part of the “Westfield Garden State Plaza Concert Series” is Toad the Wet Sprocket and Rusted Root. Toad the Wet Sprocket have made 5 studio albums which sold over 4 million copies, had 5 major hits including "All I Want," "Walk On The Ocean." Having collaborated with one another for two decades, Rusted Root, has honed the perfect combination of musical intuition, freedom and virtuosity, which has allowed them to organically shape shift their music into their own distinct and undeniable vision. A double bill of classic rock, featuring Tommy James (“Mony Mony,” ”Crimson and Clover,” “I Think We’re Alone Now”) and Felix Cavaliere of The Rascals (“Good Lovin’” “A Beautiful Morning,” “People Got To Be Free”). The music of Tommy James is heard continuously, every day, in every country in the world. For legendary singer songwriter, Felix Cavaliere, making people feel good is primary to his illustrious 50-year career. 32 years ago Paula Poundstone climbed on a Greyhound bus and traveled across the country—stopping in at open mic nights at comedy clubs as she went. She went on to become one of our country’s foremost humorists. You can hear her through your laughter as a regular panelist on NPR’s #1 show, a rascal of a weekly news quiz show, "Wait Wait…Don’t Tell Me". After more than three decades together, 38 Special continue to bring their signature blast of Southern Rock to over 100 cities a year. Thousands of audience members are amazed by the explosive power of the band's performance. Best known for their hits, “Hold On Loosely,” “Rockin’ Into the Night,” “Caught Up in You,” and more – timeless hits that remain a staple, immediately recognizable from the first opening chord. Bret Michaels is a multi-platinum global superstar who has turned his passion for music into a multi-faceted brand that encompasses record breaking touring sales. Michaels first rose to fame as the frontman of Poison. As one of rock's most iconic and enduring bands, Poison defined the fast, gritty, and glamorous rock 'n' roll scene. Bret’s solo career has charted its own course with numerous solo albums. Attention Odd Squad fans, something very odd has happened in your home town. Ms. O needs you to team up with Odd Squad agents in this live, interactive adventure to solve an exciting case. There will be gadgets! There will be villains! There will be music! There will be comfortable seats, but you’ll only need the edge… because, frankly, it’s bad for posture to sit all the way back. Well, what are you waiting for? Go! Harmonium Choral Society will take 50 members on tour to Lithuania, Latvia and Estonia from June 29-July 9, kicking it off with a free Bon Voyage concert. The concert features American composers from Oliver Holden to Elizabeth Alexander, Matthew Harris to Fenno Heath, Eliot Levine to Undine Moore, as well as Baltic composers and folksongs from around the world. About a third of Harmonium’s members are music teachers and church musicians, among a variety of other vocations, and they range in age from High School to retired. The many fine soloists are drawn from within the group. Previous international tours were Greece and Turkey (2013), Spain and Portugal, Northern Italy, Eastern Europe, and the UK. The tour chorus will perform on Saturday July 2, St. Joseph’s church, Paluse Lithuania, 6 pm; Monday July 4, 6 pm St Saviour’s Church, Rīga, Latvia; Wed. July 6, 7 pm St Elisabeth’s Church Pärnu, Estonia; Friday July 8, St John’s Church, Tallinn, Estonia. Dr. Anne Matlack is Harmonium’s Artistic Director. She holds degrees from Yale University and the University of Cincinnati and is music director at Grace Episcopal Church in Madison, NJ. Harmonium, one of New Jersey’s leading choral arts organizations, is known for its eclectic programming and community spirit, sponsoring commissions, premieres, and musicianship workshops, as well as an Outreach Chorus which performs in schools, nursing homes and other venues. They are wrapping up a crowd-funder for their award-winning NJ High School Student Composition Contest. To learn more please click here. For more information, visit www.harmonium.org or follow us on YouTube, Twitter, and Facebook! FEAST & FILM @ THE JCC ON JULY 24: MARK YOUR CALENDARS! Chris Cornell is a modern icon who transcends genre. He was the chief architect of the 90s grunge movement and remains one of the most iconic rock voices of all time. Achieving multi-platinum success with three legendary bands—selling over 30 million records worldwide - he has forged his own unique identity over three decades as a Grammy award-winning, Golden Globe nominated singer, songwriter, guitarist, composer and lyricist. His career began with Seattle trailblazers Soundgarden, whose wild soundscapes combined visceral punk attitude with artistic depth. In 1990, side project Temple of the Dog saw him experiment with a more soulful style alongside the future members of Pearl Jam. Later in the decade, his critically acclaimed solo album EUPHORIA MORNING combined lush melody and instrumentation with lyrics which spoke of alienation and despair. And as the millennium turned, he joined with three other musical pioneers from Rage Against the Machine to create supergroup Audioslave. For nearly thirty years strong, on many albums like Come On Come On, Stones in the Road, Between Here and Gone, and Ashes and Roses, Mary Chapin Carpenter has earned the trust of her audience through her willingness to look deep into herself and share joys and sorrows, good times and bad. That honesty, that quiet fearlessness, reaches a startling new level on The Things That We Are Made Of, a new full-length album scheduled to be released in May. The songs on the new album communicate with the plain-spokenness of handwritten, heartfelt letters from a confiding friend; this is art without the artifice. The result is music that is likely to be as powerfully moving as any you have ever heard. In 2014, Carpenter released her acclaimed debut orchestral album, Songs From The Movie. Arranged and co-produced by six-time Grammy winner Vince Mendoza, the record is comprised of ten previously recorded compositions including “Between Here and Gone” and “Come On Come On.” Since its release, Carpenter has performed alongside the New York Philharmonic, the BBC Scottish Symphony Orchestra, the London Concert Orchestra, the L.A. Philharmonic and the National Symphony Orchestra among many others. The voice of Rose Cousins is unmistakable. Originally from Prince Edward Island, she lives in Halifax. She has released three albums We Have Made A Spark (2012), The Send Off (2009) produced by Luke Doucet, and If You Were For Me (2006) produced by CBC in Halifax, as well as singles and recordings in collaboration with artists across Canada, the US, Ireland, Australia and beyond. ADMISSION: Admission is free, and refreshments will be served. For further information, call 201.247.8787 or 973.650.6374. Art enthusiasts are invited to meet and converse with participating artists at the avante garde ACL Art Gallery this coming Saturday. The Gallery has welcomed Virginia Schaffer Block. A native of New Jersey, Block has had her works included in hundreds of private and corporate collections throughout the East Coast and the Mid-West. She has been represented by galleries in Washington, D.C., Pennsylvania, New Jersey, New York, Ohio and Florida since 1980. Her current exhibited painting, "Midpoint," contains mixed acrylic media on canvas with collage. Flanked by three canvases, "From Your Lips #1, #2,and #3," it can be seen on the wall through the gallery entry. Works by many additional artists will also be featured. The "Steam Punk On Fire" shoe by Linda Levitt is, according to the artist, a homage to the beginning of the Industrial Revolution. The shoe, a product of industry, has been decorated with chains, gears and stars; the "fire" and the toes have been thread-painted on an industrial sewing machine. Irene Feigen's powerful mixed media collage, "Light My Fire," is a composite of various match books treated with paint, actual matches, and jewels, creating, she says, "a play on energy and fun." Mike Dziomba's painting, "On Fire," was inspired by a fall scene at the end of his street in Mendham. He notes that, as he approached the street, "the light was just hitting the tree such that it seemed the tree was on fire." He knew "on the spot" that is was going to be the subject of his next painting. Vivian Olshen's "Flowers Grow Out of a Fire," is, she states, "a ravaged landscape, indicating hope for the future." Arthur Meranus's oil painting, "Yellow Roses," is, he says, "an extremely complex painting....Yellow is the closest primary to white, which makes it a challenge to create contrast and motion." CRITICS LOVE TWO RIVER’S ALL-FEMALE “MAMA”: LAST WEEKEND TO SEE IT! Call 908-755-4654 to reserve your tickets for pickup and payment at the box office on the evening of the show. All funds raised at this performance will be for the benefit of The Historic Edison Valley Playhouse. A special evening of original sketch comedy, stand-up comics, singing, and more! Returning to host the Historic EVP Coffee House Summer 2016 series, The Pavlovian Dog Show is original sketch comedy by Claudio Venancio, Ryan Correll, and Zach McCullough. They have performed at various theaters and comedy clubs in both NYC and NJ. Sketchprov, a network featuring the best in New Jersey sketch and improv comedy! WARNING: Due to some adult language/content, some material may not be considered suitable for all audiences. 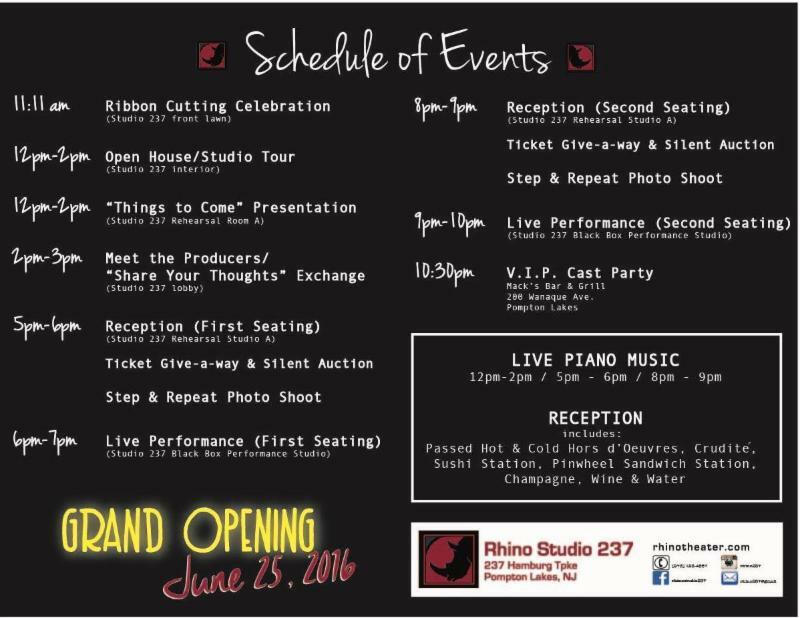 Grand Opening of Rhino Studio 237! WHEN: Saturday, June 25th. The festivities start at 11 am with a ribbon cutting ceremony and the day's events are many, including open house, tours, presentations and more. The party starts in the evening where a reception and performance will be offered in 2 seatings, one at 5pm (performance at 6pm) and the second at 8pm (performance at 9pm). WHERE: 237 Hamburg Turnpike, Pompton Lakes NJ. TICKETS: The price for both dinner and show is only $35 plus tax and reservations must be made in advance! The reception will include passed hot and cold Hors d'oeuvres, Crudite, Sushi Station, Pinwheel sandwich station and more. 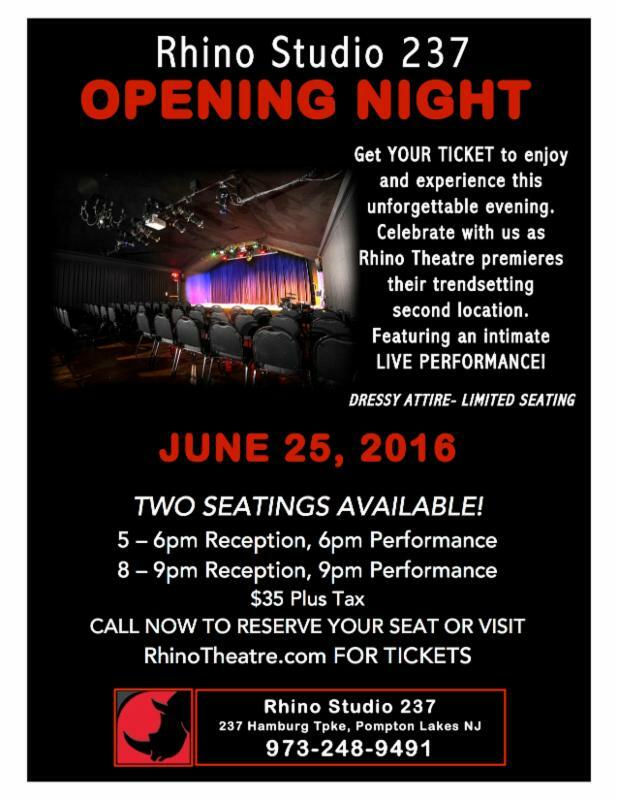 Contact Rhino Theatre for more information, and visit our website to make a reservation for Opening Night of Rhino Studio 237. This state-of-the-art new renovated facility consists of a 90-seat black box performance space, event and rehearsal studios, lesson rooms and more. This trendsetting-complex, complete with a sleek, transparent lobby invites you as you drive-by to come in and explore their new and exciting programming. 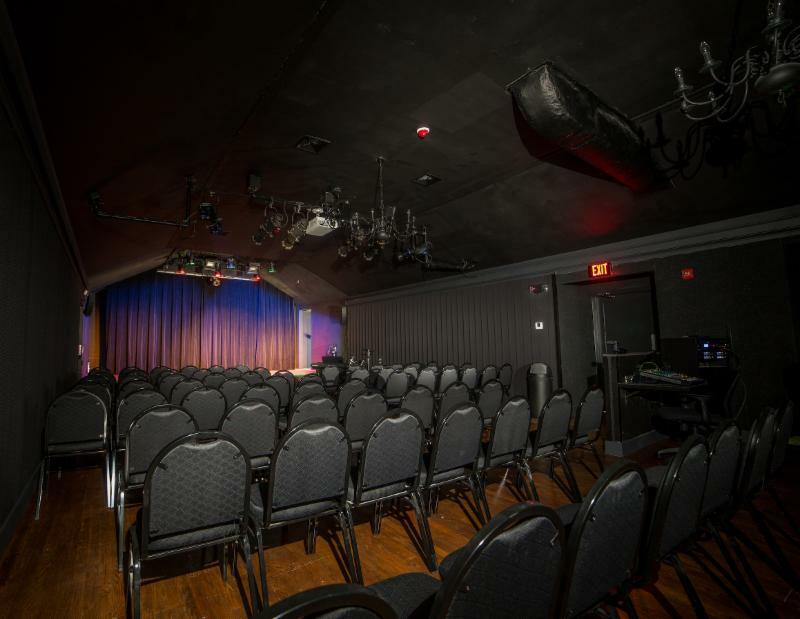 This intimate facility will serve as an addition to the present Rhino Theatre's Mainstage location and will feature plays, musicals, theatre workshops, summer camps, open mic nights and more! The possibilities are endless! Included are two digital projection systems where classic films can be shown! Rental opportunities abound! 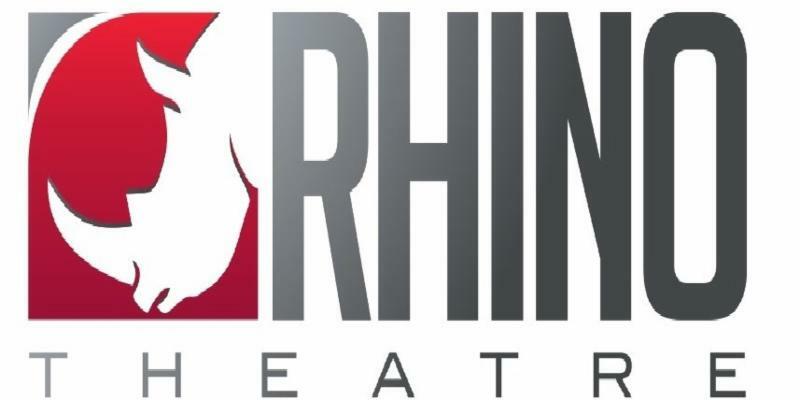 Contact Rhino Theatre if you are need of a rehearsal or performance space, art studio, fundraising event, seminar, piano and musical instrument instruction, yoga and exercise classes, or even a wedding! WHEN: Sunday, June 26th, 4 p.m.
TICKETS: $18 members, $20 non-members, $12 students; Sponsorship: $50 (includes two tickets and acknowledgement in the program). The Jewish Heritage Museum of Monmouth County is proud to present The French-Jewish Connection, a chamber music concert featuring the works of Camille Saint-Saens, Darius Milhaud, George Bizet, Maurice Ravel and Jacques Offenbach. You are in the middle of a boisterous bouncy bingo hall for this happy musical of fun and friendship as three flamboyant ladies grab their numbered cards with gusto in a singing celebration of their love for the game, and a sudden blackout rouses them to recall the glory of long-lost friends as they embrace the joys of life and high hopes for a cheerful future. There will be a vocal audition. Please prepare 16-32 bars of a song selection, in a style similar to the show. Wear comfortable clothing as there will also be a simple dance/movement element of the audition. WHEN: Friday, June 24th, at 7:00 p.m. ADMISSION: Admission to the reading is $5, and proceeds will benefit NJSEEDS, an organization that changes the lives of motivated, high-achieving students from low-income families by transforming their educational opportunities. Tickets can be purchased at njpac.org/events/detail/njpac-stage-exchange-the-commissions, or by calling 1-888-GO-NJPAC (1-888-466-5722). New Jersey Theatre Alliance, in partnership with New Jersey Performing Arts Center (NJPAC) and Newark Celebration 350, invites the public to a reading and discussion of Surely Goodness and Mercy, one of three new plays by New Jersey playwrights about New Jersey issues commissioned this year through the NJPAC Stage Exchange program. The play is about Tino, a fictional Newark school boy who is sent to live with an abusive aunt after his mother dies protecting him in a street fight. Tino befriends the cantankerous lunch lady at his school who has been diagnosed with multiple sclerosis (MS) and has difficulty getting the healthcare she needs. The two unlikely friends band together to help each other navigate a world of violence, privation, and injustice. Chisa Hutchinson is a member of New Dramatists, a Humanitas New Voices Fellow, and a Tow Playwright-in-Residence at Second Stage Theater in New York. Her plays have been produced by the Lark Play Development Center, City Parks’ Summerstage, the New York NeoFuturists, Partial Comfort, Mad Dog Productions, Atlantic Theater Company, NJPAC, New Dramatists, Rattlestick Theater, the Contemporary-American Theater Festival, Midtown Direct Rep, Writers Theatre of New Jersey, Second Stage Theater, Forward Flux Theater, the Working Theater, and FilmGym. Hutchinson earned a BA in Dramatic Arts from Vassar College and an MFA in Playwriting from NYU. The event includes a reading of the script by professional actors, followed by a panel discussion and open Q&A, where audience members can share their perspectives on the many issues addressed in this play: children living with abuse, adults living with MS, and the experiences of low-income families in Newark. Panelists include playwright Chisa Hutchinson; Stuart Cook, MD, the Ruth Dunietz Kushner and Michael Jay Serwitz Chair in Multiple Sclerosis and Director of the MS Diagnostic Treatment Center at Rutgers – New Jersey Medical School; Rosemary S. McGee, a humanities scholar and medical humanities faculty member at Morristown Medical Center; Dr. Ellen Anthony Moore, an assistant professor of theatre arts at Marymount Manhattan College; and Sharon Zucker, Dean of Guidance at NJ SEEDS. As part of the NJPAC Stage Exchange program, Hutchinson is working with Writers Theatre of New Jersey, a professional theatre organization in Madison, NJ, that will present a full-scale production of Surely Goodness and Mercy in 2017. Operatic mezzo­soprano Jessica Renfro and pianist Lynda Saponara have joined forces to present "American Heart: A Benefit for Child Refugees in Syria," an evening of multimedia musical entertainment, food, and activities for children. The event is BYOB. Since the Civil War in Syria began in 2011, more than 250,000 Syrians have lost their lives, and more than 11 million have been forced to leave their homes. An estimated 3.7 million children have been born since this conflict began. Through their #ChildrenofSyria campaign, UNICEF has provided clean water, medical vaccinations, education, and psychological support throughout this crisis. This event is being produced by A Moment for Music, a company with a core mission to bring great music to great causes. A free will offering will be taken at the door, and all money will be donated to UNICEF's #ChildrenofSyria campaign. 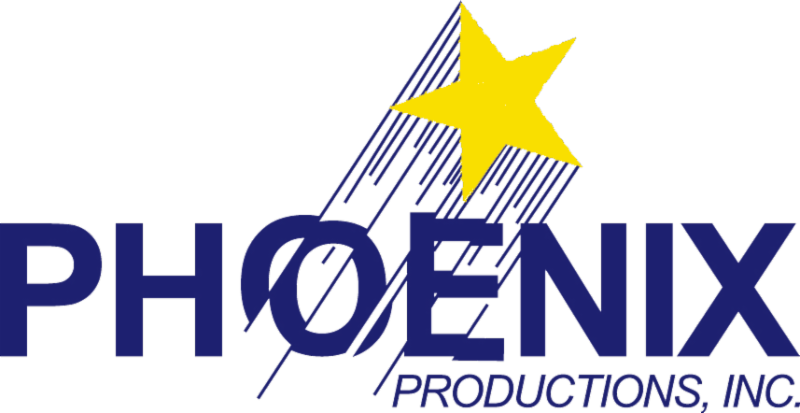 More about this production company and its artists is available at www.amomentformusic.com. Multi-platinum Irish music sensation Celtic Woman presents Destiny, an enchanting new show and world concert tour that honors Ireland's past while bringing a contemporary musical edge to songs old and new. The tour celebrates the release of Celtic Woman's newest album, Destiny (which dominated the #1 spot on Billboard's World Music chart for seven weeks, their 9th album to hit #1 in a decade-long career). The Destiny Tour features an entirely new production showcasing vocalists Mairéad Carlin, Susan McFadden and newest member Éabha McMahon, along with brilliant Celtic violinist and founding member Máiréad Nesbitt, accompanied by a group of equally talented musicians and dancers. Their 10th album and first of all-new material since 2011 Believe, Destiny features a fresh fusion of traditional Irish music and modern songcraft, including the Waterboys classic "The Whole of the Moon," Ed Sheeran's "I See Fire," from The Hobbit, Mutt Lange's "Walk Beside Me," Brendan Graham's "Sometimes a Prayer Will Do," and the popular video game theme, "Skyrim." In 2016, as Ireland commemorates the Irish Rebellion of 100 years ago that led to its nation's independence, Celtic Woman offers a rousing version of "Óró sé do bheatha 'bhaile," an anthem closely connected with the 1916 Easter Rising. The group also delivers timeless traditional Irish songs such as "Bean Pháidín" and "Siúil A Run" highlighting the beauty of Ireland's heritage and its Gaelic language. This unforgettable live concert experience features all new stage designs, stunning wardrobes and magnificent arrangements with superb choreography. Celtic Woman made its debut on PBS in 2005 and achieved massive success encompassing nine albums and eight DVDs which sold over nine million copies worldwide and reached platinum-level sales in nine countries. As a touring powerhouse, the group has performed for over three million fans on six continents in 23 countries. Join Celtic Woman on the next chapter of their musical journey—a true destiny to be shared by all! This marks the Festival's 30th anniversary since its debut at New Jersey's Waterloo Village in 1986 and the fourth time the Festival will be held at the New Jersey Performing Arts Center (NJPAC) as well as other venues in Newark's Downtown Arts District, all within easy walking distance of NJPAC. "We need poetry now more than ever," said Martin Farawell, Poetry Director, "These days, we don't have to look very far to be bombarded with language that is ugly and thoughtless. Just spend a few minutes searching the internet or watching television: someone or some group is always insulting or bullying another. Poetry reminds us our incredible gift of speech is also there to connect us. Poets invite us, complete strangers, inside their most private thoughts. I have never witnessed people experiencing this more powerfully than at the Dodge Poetry Festival." The Geraldine R. Dodge Poetry Festival, an initiative of the Geraldine R. Dodge Foundation held biennially in even-numbered years since 1986, is a celebration of poetry that immerses participants in four days of readings, performances, and conversations. In its 30-year history, the Dodge Poetry Festival has involved nearly 600 poets, including Nobel Laureate and U.S. Poet Laureates; Pulitzer Prize and National Book Award winners; Guggenheim, Fulbright, MacArthur and NEA fellows; and an unparalleled array of much-published and award-winning poets. The Dodge Poetry Festival is the largest poetry event in North America. Called "Wordstock" by The New York Times, audience members have the opportunity to hear performances from and interact with dozens of the world's foremost poets with an extraordinarily wide range of backgrounds and styles. Two-Day and Four-Day Passes are on sale now at www.njpac.org and at the NJPAC Box Office. Single Day tickets go on sale August 15. This 30th Anniversary Dodge Poetry Festival inaugurates an historic collaboration with the renowned Academy of American Poets that will fully integrate their annual Poets Forum into the Festival. The Poets Forum, previously held in New York City, brings together the Academy's Board of Chancellors for readings and conversations. Members of the Board of Chancellors who will participate in the Poets Forum as well as other events at the Festival, include: Juan Felipe Herrera, recently appointed by the Library of Congress to a second term as U.S. Poet Laureate; Elizabeth Alexander, a Pulitzer Prize finalist who was the official "inaugural poet" at President Barack Obama's first inauguration in 2009; National Book Award winner Mark Doty; Linda Gregerson, Brenda Hillman, Jane Hirshfield, Marilyn Nelson, Alberto Ríos and Arthur Sze, all of whom received Guggenheim Fellowships among other honors; National Book Award finalist Alicia Ostriker; NEA Fellowship recipients Claudia Rankine and Anne Waldman; and Khaled Mattawa, recipient of a MacArthur Fellowship. Poets who will be giving Featured Readings from the stage of NJPAC's Prudential Hall during the Festival include former U.S. Poets Laureate Billy Collins, Kay Ryan and Robert Hass; Pulitzer Prize winners Gary Snyder and Vijay Seshadri; National Book Award winner Robin Coste Lewis and National Book Award finalist Tim Seibles; NEA Fellowship recipients Marilyn Chin and Katha Pollitt; and Guggenheim Fellowship recipients Martín Espada and Li-Young Lee. Academy Chancellors who will offer Featured Readings in Prudential Hall are U.S. Poet Laureate Juan Felipe Herrera, Brenda Hillman, Jane Hirshfield and Claudia Rankine. Parkington Sisters, who participated in the 2014 Festival, will return to be among the musical artists presented during the Festival. Poets from several significant area and national poetry and writing organizations will offer special readings during the Festival, including: Kundiman, dedicated to the cultivation of Asian American creative writing; Cave Canem, a writers center with a focus on African American poets and writers; CantoMundo, a national organization devoted to Latina/o poets. Special readings will also include Warrior Writers, which provides a creative community for the artistic expression of veterans, and Brick City Voices, featuring some of Newark's brightest emerging poets. The Festival will also feature, for the first time, readings by the winners of the Ruth Lilly and Dorothy Sargent Rosenberg Poetry Fellowship. The Fellowship recipients are the winners of a national competition sponsored by the Poetry Foundation, publisher of Poetry magazine. Established in 1989 by the Indianapolis philanthropist Ruth Lilly, the fellowships are awarded to U.S. citizens or residents between the ages of 21 and 31 and are intended to encourage the further study and writing of poetry. THE ACADEMY OF AMERICAN POETS CHANCELLORS READING Opening the 2016 Festival's evening events on Thursday, October 20. POETRY SAMPLER A celebration of the diverse poetry community in which twenty-five leading poets offer short, back-to-back readings. MAIN-STAGE READINGS IN PRUDENTIAL HALL These late afternoon and evening programs of half-hour readings on the main stage have been a central feature of every Dodge Poetry Festival since 1986. For the third time, they will take place in the New Jersey Performing Arts Center's beautiful and acoustically splendid Prudential Hall. FESTIVAL POET READINGS Festival Poet Readings provide excellent opportunities to experience more sustained readings by some newly discovered voices and some old favorites. During the daytime hours, Festival Poets give a series of readings from multiple stages throughout the Festival site. Typically, these are one-hour readings shared by several poets, who each read for ten to fifteen minutes. THE WORK TO BE DONE: POETRY AND SOCIAL JUSTICE Taking its title from the closing words of Gwendolyn Brooks' "to the Diaspora," with its reminder of the work that remains "to be done to be done to be done," this special event includes a discussion with Martín Espada, U.S. Poet Laureate Juan Felipe Herrera, Katha Pollitt, Claudia Rankine and a guest moderator, followed by a powerful performance including poetry, music and hip hop. SILENCE IS BECOME SPEECH: THE EMERGENCE OF WOMEN'S VOICES "Silence is become speech," Muriel Rukeyser wrote in "The Speed of Darkness," one of her groundbreaking poems. Compare the number of women poets in any turn-of-the-19th-century anthology with that of a collection published today and the emergence of women's voices in the century is dramatic. What has this shift meant to poetry in general? How has it affected what we, as readers, expect or accept from poetry? How has it changed the poems that men write? That women write? What does it mean for women to have a sense of community within the poetry community? MASKS AND MASCULINITY: POETRY AND THE RITUALS OF MEN Our cliché notions about the "poetic" personality and the "masculine" one may seem completely at odds, yet many poems have been written that celebrate the rituals of men, their rites of passage, the behaviors that society overtly or tacitly accepts as validating masculinity. Some of these poems, although once part of the "official" canon, are now viewed as misogynistic or celebrating self-defeating, even self-destructive behaviors. How does poetry help men navigate societal demands regarding masculinity? What masks does it offer to hide behind? What opportunities to question them? WHO IS IT CAN TELL ME WHO I AM: POETRY AND IDENTITY Having lost all the trappings that secured his identity, King Lear asks, half mad with desperation, "Who is it can tell me who I am?" Poetry, like all the arts, invites us to ask who we are. How we explore, discover, express, define and challenge who we are through poetry will be the focus of this conversation. TRIBUTE TO GALWAY KINNELL An event celebrating the life and work of poet Galway Kinnell, Pulitzer Prize and National Book Award winner and long-time Festival favorite, who passed away shortly after the 2014 Festival. CELEBRATION OF AMIRI BARAKA A celebration of Amiri Baraka (1934-2014), the Newark-based poet and founding father of the Black Arts movement, and a participant in numerous Dodge Poetry Festivals, including the first two in Newark, will take place the first weekend of October 2016 at Newark Symphony Hall to mark the start of Newark's October Poetry Month. POETRY AND STORYTELLING Many of the first poems told stories. For millennia the boundary between bard and storyteller was indistinct. Our ancient epics all encompass grand narratives. Some have asserted that the rise of prose fiction has negated the need for poetry to continue to tell stories. So how and why do narrative poems continue to have a powerful hold on many readers and listeners, and appeal to so many contemporary poets? How does poetry tell stories in a way no other kind of writing can? POETICS OF WAR: WRITING THE MILITARY EXPERIENCE Veterans who have participated in Warrior Writers and Combat Paper NJ workshops share their work and discuss the importance of opening a dialogue between veterans and their communities. Panelists talk about how both organizations provide a supportive network and outlet for communicating their military experiences honestly, helping challenge the "silent veteran" stereotype. POETRY AND PRIDE From Sappho to Whitman to Ginsberg to Rich, poetry as we know it would not exist without the contributions of the LGBTQ community. No doubt members of this community have found and forged some of their sense of identity and kinship through the shared experiences and feelings communicated through poetry. Festival Poets will discuss how personal pride is discovered and fostered through poetry and the poetry community. QUIET SPACES Comfortable, quiet places will be designated for whenever attendees might need a moment for retreat or contemplation. Some will feature silent, prompted opportunities to contribute to group poems. Anchored by events at NJPAC, the Festival will transform Newark's Downtown Arts District into a "Poetry Village," with many of the performances and readings occurring at multiple venues and cultural destinations in the city, all within easy walking distance of NJPAC. At times during the Festival ten or more separate stages will offer events simultaneously for audiences from 100 to 2,000 people, including at the Aljira Center for Contemporary Art, NJPAC's Center for Arts Education, First Peddie Baptist Memorial Church, the New Jersey Historical Society, the Newark Museum, Newark Symphony Hall, North Star Academy, and Trinity & St. Philip's Cathedral. Each evening and Sunday afternoon all readings will take place in NJPAC's magnificent Prudential Hall. "From the very first day of the first Festival held in Newark in 2010 we knew that the city and the various venues at NJPAC and in the Downtown Arts District were great places to experience poetry," said Chris Daggett, President and CEO of the Geraldine R. Dodge Foundation. "The board and staff of the Foundation are thrilled to return to NJPAC and the City of Newark and we look forward to offering audiences the opportunity to see and hear some of the icons of the age as well as newer voices in poetry. From Poets Laureate to slam champions, there's something for everyone, even people who don't yet know how powerfully poetry can speak to them." "We are delighted to welcome back the Dodge Foundation and join with them and the City of Newark in hosting the largest Poetry Festival in the country," said John Schreiber, President and CEO of NJPAC. "The Dodge Poetry Festivals have brought thousands to Downtown Newark, including students from across the country, to experience the power and poignancy of the world's greatest poets in addition to the myriad cultural and culinary offerings in our hometown. We look forward to anchoring the Festival's 'Poetry Village' again in 2016." "Poetry in our country benefits from having multiple organizations championing its importance, and our organizations benefit when we share resources and opportunities. We're thrilled that the Dodge Poetry Festival has invited our Chancellors to be a part of their 30th anniversary gathering. And we're especially excited to present programming in Newark, a city led by a poet, Ras Baraka," said Jennifer Benka, Executive Director of the Academy of American Poets. Known for its tremendous ethnic and cultural diversity, downtown Newark is located three miles from Newark Liberty International Airport, one of the largest international airports in the United States. Downtown Newark is easily accessible by public transportation via Amtrak, New Jersey Transit (NJ TRANSIT), and PATH trains, and is located at the center of the New York metropolitan area. Once again, as a key component of the Dodge Foundation's commitment to a healthier environment, the Festival will partner with NJ TRANSIT to make public transportation more affordable for Festival-goers. NJ TRANSIT will offer $10.50 ticket vouchers for Festival participants for a round-trip ticket from any NJ TRANSIT rail station to Newark Penn Station or Newark Broad Street Station. The voucher will also be honored on the Newark Light Rail once riders arrive in Newark. Vouchers can be purchased with Festival tickets online, over the phone, or at the NJPAC Box Office. *TICKETS: Festival Passes offering Two-Day or Four-Day admission are available now. Prices for a Weekend Pass (Saturday and Sunday admission) are $60 with discounted admission available at $54 for seniors and teachers with ID, and $30 for students and Newark residents. Four Day Passes providing entry to all events at the Festival, Thursday through Sunday, are $100 with discounted admission for seniors and teachers at $88 and students and Newark residents at $50. Tickets are available at the NJPAC Box Office, 1 Center Street, Newark NJ, online at www.njpac.org or by phone at 1-888-GO-NJPAC. To register, visit dragonflyartsnj.com or http://goo.gl/EGy1by. For more information, email at dragonflyartsnj@gmail.com or call 908-930-3210. Dragonfly Multicultural Arts of Metuchen will offer its first summer theatre camp for kids this August. Dragonfly Theatre Camp will give students in grades 3 to 8 opportunities to explore many different areas of theatre, including acting, design, and directing. Throughout the two weeks, campers will play theatre games, create scenes through improv, write their own scripts, film short stories, create costume and set designs, and prepare and present a play for family and friends. In addition, theatre professionals and actors with experience performing in New York City will speak to campers about careers in the theatre. Dragonfly Theatre Camp will be led by the company’s artistic director Catherine LaMoreaux, who teaches Dragonfly’s acting classes and has taught theatre camps for various organizations in Metuchen and Ann Arbor, Michigan. Catherine is an experienced public school teacher and is certified to teach drama and English. She believes in the ability of theatre to help students build communication, English, performance and collaborative skills. Dragonfly is a nonprofit cultural arts organization incorporated in the state of New Jersey. Dragonfly is committed to offering arts education and performing opportunities for people in our community. “1776” OPENS IN EAST BRUNSWICK THIS FRIDAY NIGHT!